Saskatoon is off to a great start! 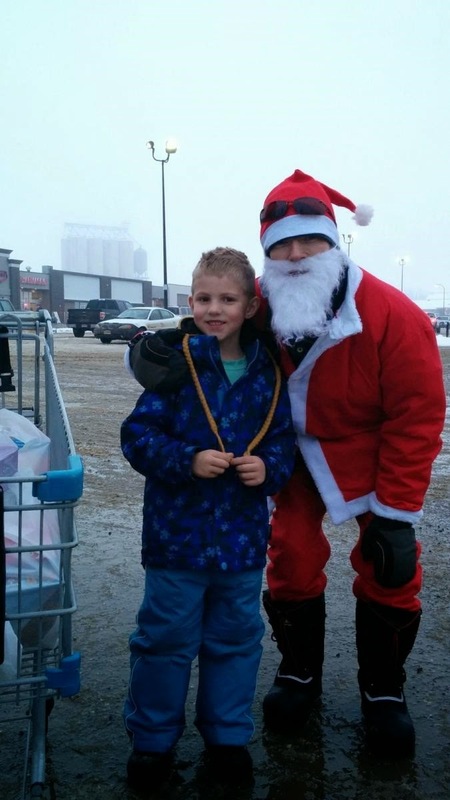 18 Wheels Of Christmas in Saskatoon raised another $311.42 and received over 100 pounds of food while situated at Independent Grocers at 2815 Waneskewin Road Nov 23rd. 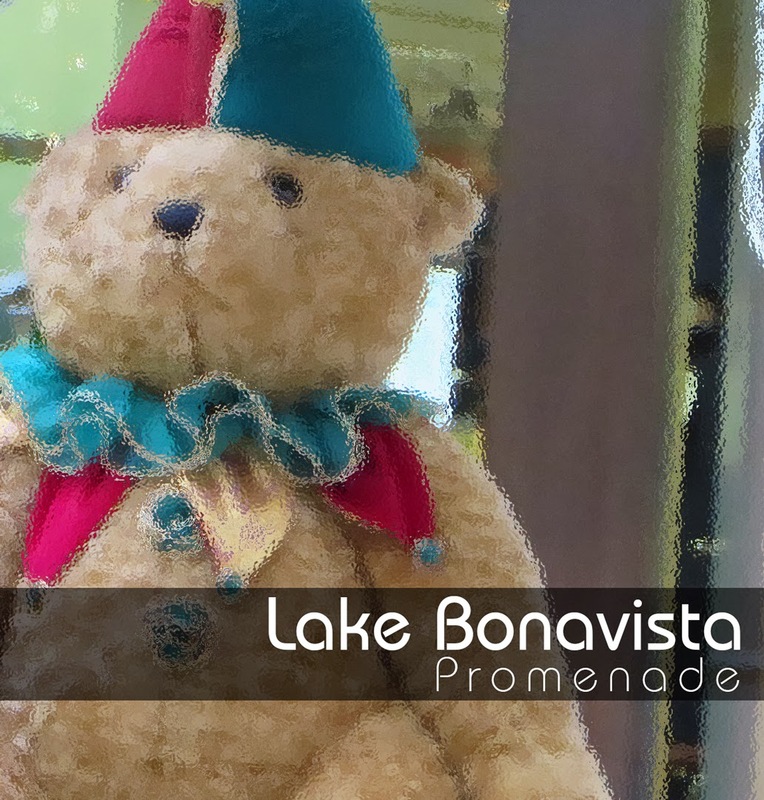 We are scheduled to set up again December 6th and 7th as well as December 13th from 9:30 am until 2:30 pm. We would like to invite everyone to come out and see us. For $1.00 you have a chance to win one of three gift cards. A $200.00 Keg gift card A $150.00 Chili’s card and A $100.00 Tim Horton Card. 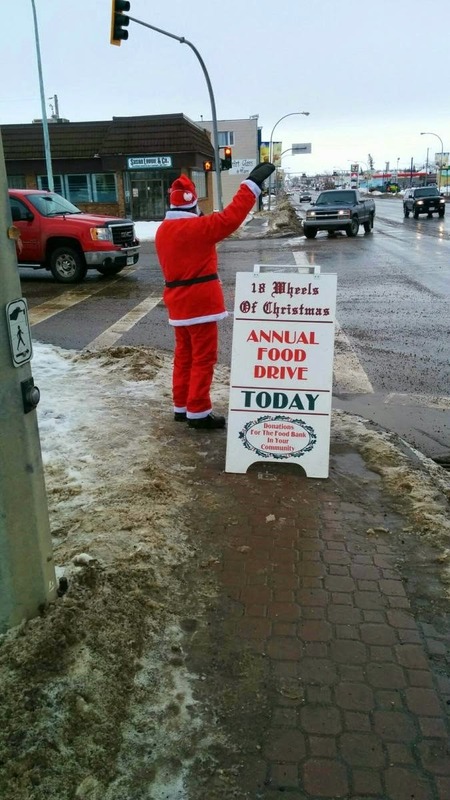 All the proceeds go to purchasing much needed baby food and other non-perishable items for the Saskatoon Food Bank and Learning Centre. 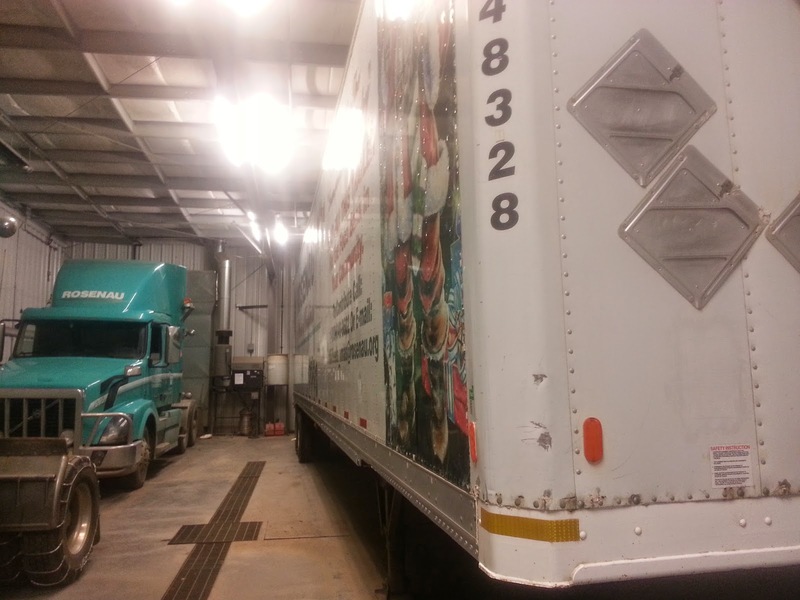 Once again we are excited and thrilled to receive 12-15 skids from Maple Leaf Foods to take down with the trailer on delivery day December 16th at 10:00 am. Thank you ALL for your continued support and heartfelt donations to make this campaign a success for those in need in Saskatoon. 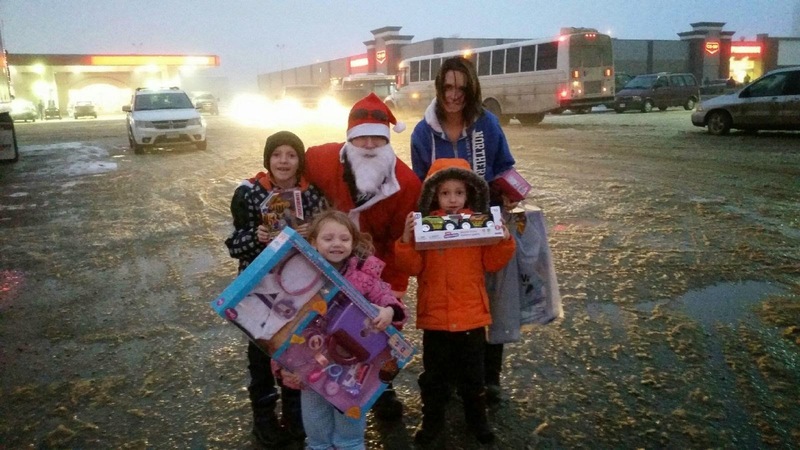 What an incredible two day event in Dawson Creek BC! 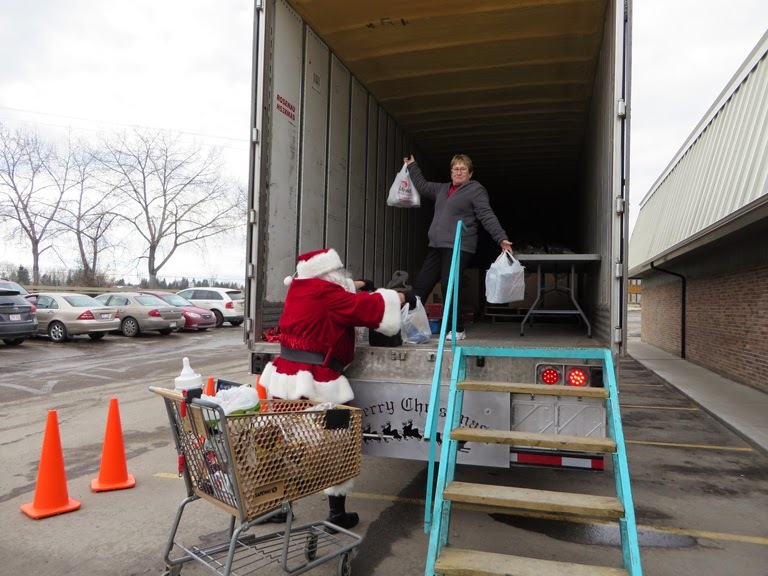 Well over half a trailer load of food, thousands in cash donations and hundreds of new toys filled the trailer. What is more amazing is that this all occurred in a community of 12,000 people but they gave like they were 120,000! 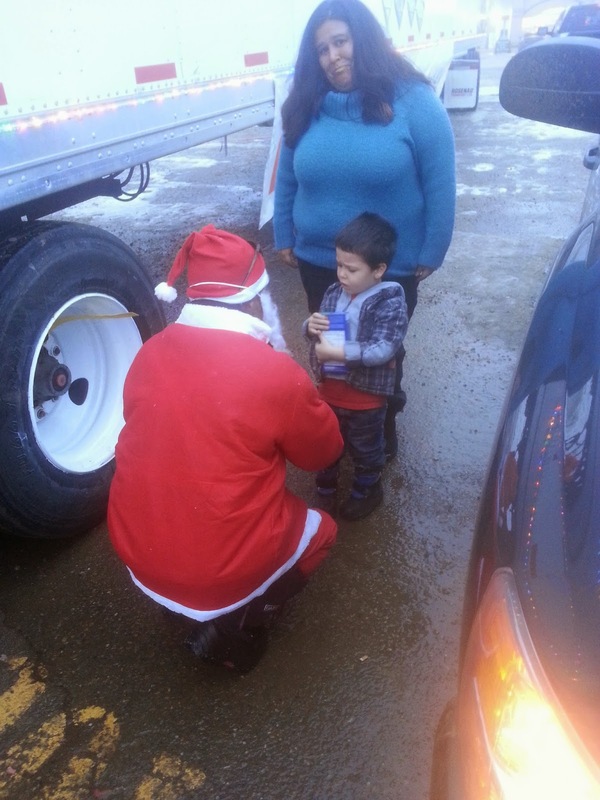 The United Way/Salvation Army 18 Wheels of Christmas event was a phenomenal success! We have so many great stories. Another lady came up and told us quite matter of factly that she has NEVER donated anything to anyone, but when she saw what we were doing and why we were doing it, she came back from the store with a full cart of groceries. Live and On Location in Dawson Creek BC. The trailer is completed, lights are on and it looks sharp. Thanks to all the elves who gave so much time to this effort. 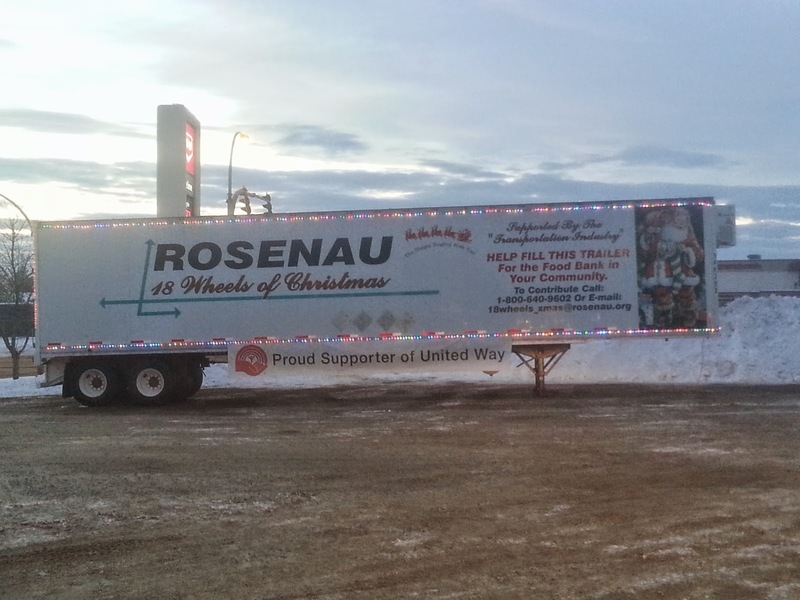 We are all ready for the United Way Toy and Salvation Army Food Drive kicking off tomorrow at 10:00 am! Our volunteers from Nawichan Friendship Centre, Calfrac, United Way and the Salvation Army are all lined up! This is a two day event so stay tuned! 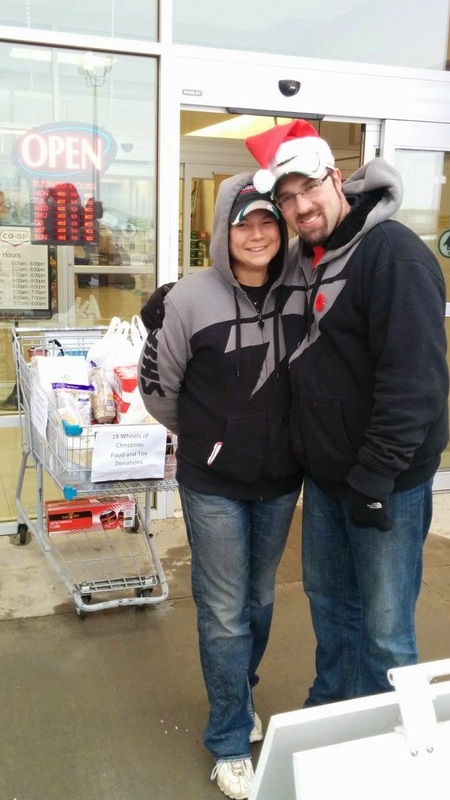 Also a huge thank you to the Dawson Creek Co-Op for the use of their parking lot and promoting the event in store! We were thrilled to be asked to be a part of Independent Grocers open house this past weekend November 8th and 9th to sell raffle tickets to the public and receive donations of non-perishable food for our Saskatoon Food Bank and Learning Center. 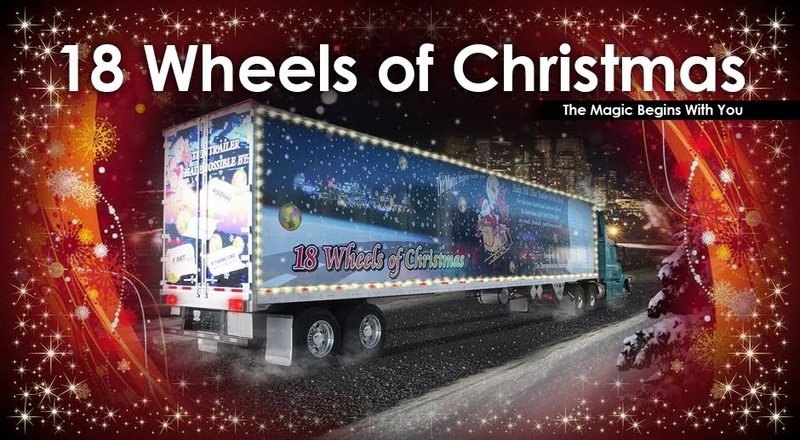 We will go LIVE with Global tomorrow morning promoting the 18 Wheels of Christmas trailer prior to the Annual Santa Claus Parade this weekend on Sunday November 16th at 1:00 pm as well as CTV News on Friday November 14th. 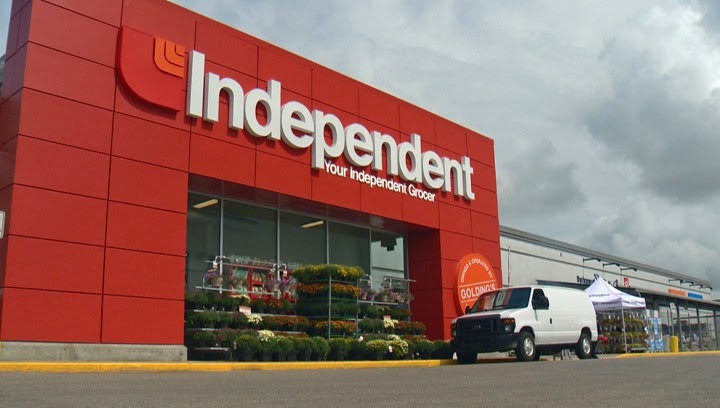 We are excited to spend more time at the Independent Grocers at 2815 Waneskewin Road on November 22nd and 23rd. 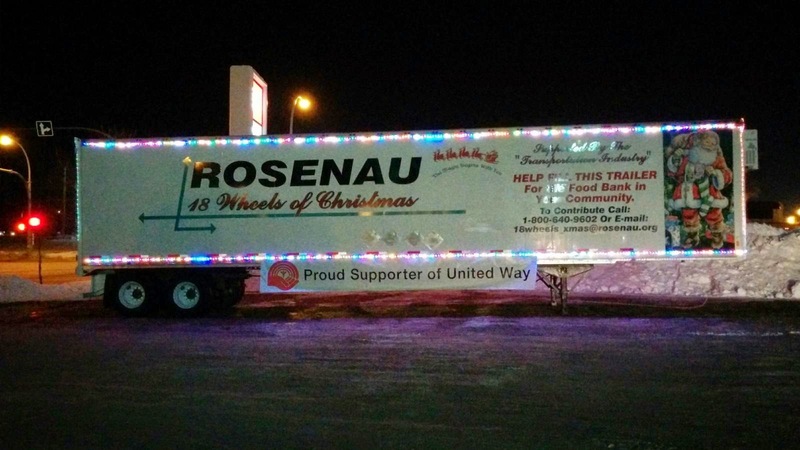 The 18 Wheels of Christmas trailer for Saskatoon will deliver to the Food Bank on December 16th. We have already been receiving monetary donations to help with purchasing food and other companies wishing to donate food and put together hampers for us to pick up. It is another exciting time here in Saskatoon and we are thrilled that so many people have pulled together to make this campaign a success! 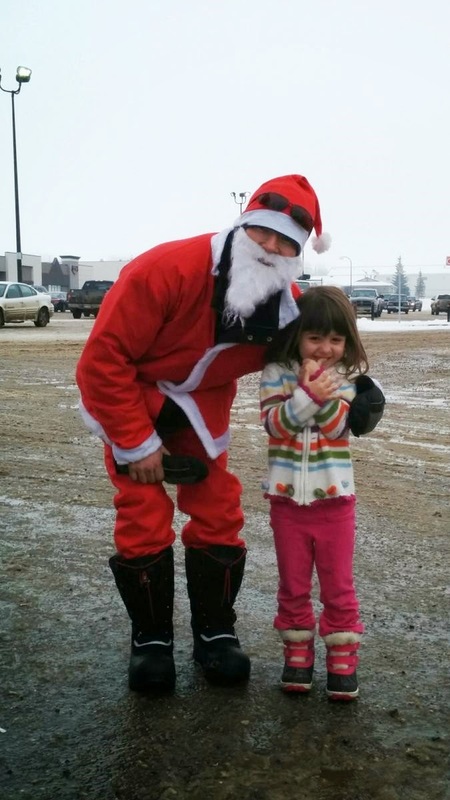 Here in Dawson Creek, British Columbia, being that much closer to the North Pole has it's advantages. Santa's elves have a short break before their busy season kicks in so they have been hard at work polishing every square inch of our 18 Wheels trailer in preparation for it's Northern events. It looks great! Can't wait to see the lights and the finished package!